HK Audio Linear 3 is here. Renowned German audio specialists HK Audio have a brand new range of powered speakers in the Linear 3 range. Based off the incredibly powerful Linear 5 models the Linear 3 aim to provide High quality audio for DJs and bands in every situation. The premise of the linear 3 is provide high quality audio whilst sounding great in any set up straight out of the box. These are designed with true plug and play in mind and offer the end user a selection of digital presets to suit their environment. All Linear 3 boxes are made in Germany and are available with a 5 year warranty upon registration on the HK website. The Linear 3 is available in a 12" full range, 12" angled box for monitor as well as FOH use and 15" full range box. For those craving more low end, HK offer an 18" powered sub and a first for HK Audio, a 15" powered sub. Delving into the details of the Linear 3 top boxes sees a class D 1200 watt amplifier capable of producing a max SPL of 135db. This should comfortably provide audio to audiences of up to 500 with the appropriate sub-woofer being used. Taking a useful feature from the older Pulsar range Linear 3 uses a multi band limiter. Rather than limiting the entire signal it can apply the safety measure to the parts of the sound that are being pushed too hard. If the low end is being limited your top end should still be crystal clear. While the speaker sounds great out of the box there a 4 EQ presets to help accommodate specific situations. Bass boost increases low end between 60 and 100 Hz for extra depth and punch. When using the top box with a sub this can be set to flat ensuring that e frequency response remains linear all the way down to the cutoff frequency for optimum subwoofer coupling. On the 112XA version putting this position to flat provides a more assertive signal for use as a monitor. The contour switch when set to flat provides an optimum linear frequency for audio performance. However when engaged it can reduce the mid frequencies centered on 3.5 kHz by as much as 6dB. This is ideal if the speaker is being used in confined spaces and audience is quite close to the speaker as it reduces listening fatigue. The subs are equally as flexible and provide a perfect match for not only the Linear 3 top boxes but Linear 5 as well. They can also be coupled with another of HK Audio's products, the Elements systems. These can provide a serious low kick to an already powerful set up. Available in 18" and 15" configurations each sub uses a 1200 watt class D amp and is housed in like their top box counterparts in 16mm MDF. The configuration switch sets the sub to be used as an individual or dual sub. 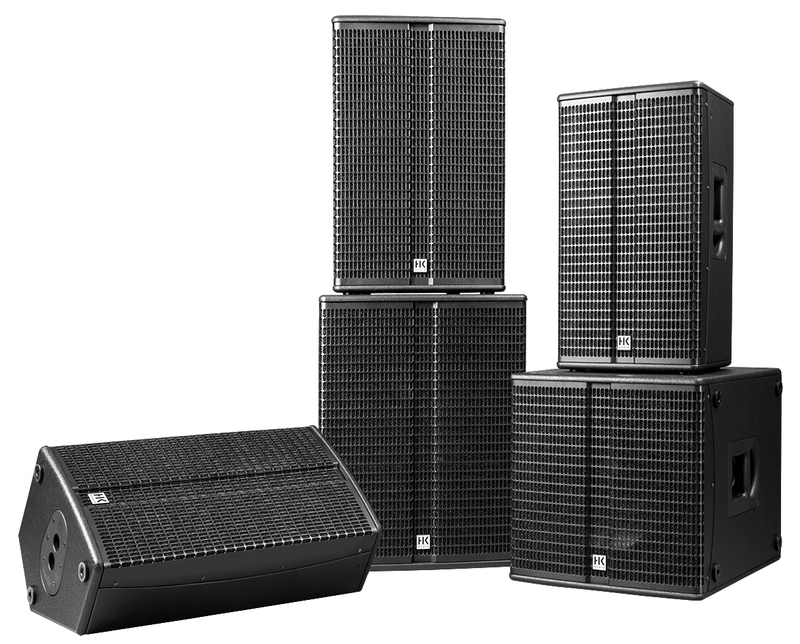 In dual sub the levels of the 2 mid/high line out are boosted by 6dB to bring the top unit in line with the 2 subs. The cross over switch allows user to set the cross over between 100 Hz or 120 Hz. So depending on the venue the cross over can be set as required.